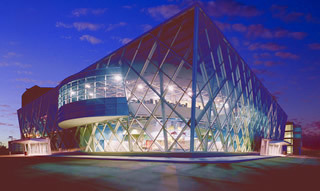 This year’s conference will be held at Chrysler Headquarters in Auburn Hills, MI. NAEM has secured a nearby hotel, Auburn Hills Marriott Pontiac at Centerpoint. The hotel is only minutes away from the conference location. Book your travel early to take advantage of early bird savings. Learn more about Chrysler Group's Headquarters. The City of Auburn Hills is a distinguished leader in southeast Michigan, known not only for its 22 high-technology parks, but also for having world-renowned retail, entertainment and manufacturing. Home to more than 21,000 residents, it also serves as Michigan’s global business address, with 40 international corporations from 32 countries housed here, including many world and North American headquarters. Auburn Hills was recently recognized by the Southeast Michigan Council of Governments (SEMCOG) as a “Sustainable Community," and initiative that recognizes communities that have taken the initiative to incorporate sustainable activities into their practices. The closest airport to Chrysler Group headquarters is the Detroit Metropolitan Wayne County Airport (DTW). The airport is about 45 miles away from the conference location. You can find specific information on the airport on the airport's website.